Jesus Christ. Alpha and Omega: Saint Joseph of Arimathea. Part Two: Wrongly tied to Britain. 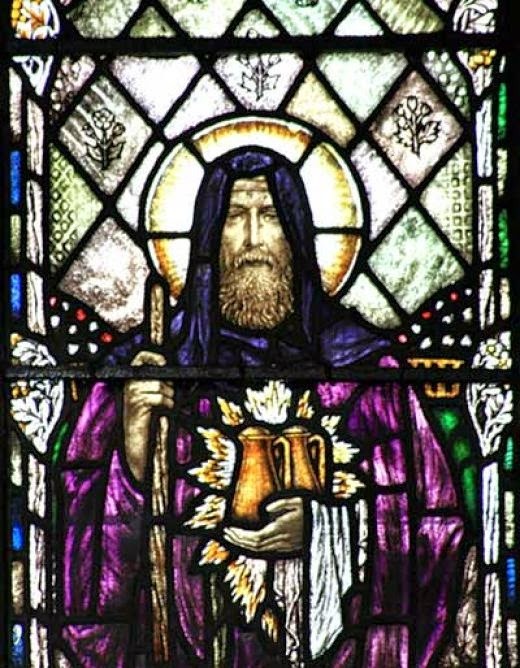 Saint Joseph of Arimathea. Part Two: Wrongly tied to Britain. “Meanwhile, in the West a scribal insert began Joseph's new career, which ultimately transported him to "Britain"—really Britio Edessenorum, place of the shroud icon—with an object known as the Holy Grail”. The links of my hypothesis are in place. Edessa possessed from the fourth century a cloth icon of Jesus' face (attested by artists' copies), later verified as a life-sized icon of his body. It had been folded and encased so as to reveal only his face, in essence disguised, and later hidden away. Lucius Abgar VIII (177-212), first Christian king of Edessa and in touch with Rome, may have received it (I won't insist on this), along with the missionaries he himself requested (letter of King Lucius to Pope Eleutherus). In the fourth century it was given a fabricated aetiology as a face-only icon that had arrived in Edessa in the first century (Teaching of Addai). From the sixth century on, it was suggested, then eye-witnessed, as larger and gradually documented as Jesus' burial cloth. The burial cloth of Good Friday was intimately associated with Joseph of Arimathea. The object in question at the time the Grail romances were written was somehow known to be associated with Joseph. an object known as the Holy Grail. The two objects share significant virtually identical properties. The cloth is unique among Byzantine icons as the Holy Grail is unique. All the links would indicate that the key elements of the Grail romances derive from Byzantine sources, particularly those that relate to Edessa’s icon, the Mandylion. Let us consider the Grail's secret from the point of view of a medieval Christian. As cup of the Last Supper and container of the blood of Jesus, believed to be God incarnate, it is already so awesome as not to require the embellishment of some further, anticlimactic secret. So why a secret in the first place? It only makes sense if the Grail, alias the Mandylion, truly contained a further mystery in the revelation of its real contents: the gradually appearing body of crucified Jesus of the Mandylion’s ritual. Finally, that eighth-century Georgian manuscript--it antedates by centuries every Christian Grail narrative--may alone contain the truth: Par. 16 says , "I [Joseph] climbed Holy Golgotha, where the Lord's Cross stood, and I collected in . . . the large shroud the precious blood that had flowed from His holy side." …. Please see again Robert de Boron's version of this event, which simply substitutes the Grail for the shroud. In the apocryphal tradition about Joseph of Arimathea, then, before Joseph's Holy Grail as cup of Jesus' blood, there was Joseph's cloth in which he had captured the blood of Golgotha. Britium's face icon (Mandylion) was over time identified as a burial shroud icon of the body of crucified Jesus. The mysterious tenth-century ritual in Britium/ Edessa and the new twelfth-century Byzantine Melismos service, inspired respectively by the presence of this reputed burial wrap, portrayed the infant Jesus becoming the adult Jesus, sacrificial victim of the Last Supper and Passion. The romance Holy Grail also revealed the mystery of the infant Jesus changing to the body of crucified Jesus. Was this the secret of the Holy Grail? Was the Grail's secret the Mandylion's secret?